CreatineOlimp Creatine Strong Matrix 7 - 120 kaps. Olimp Creatine Strong Matrix 7 - 120 kaps. CREATINE STRONG MATRIX 7 ™ - each capsule of this unique product created in cooperation with scientists, Olimp technologists and Pudzian himself contains SEVEN! MOST ACTIVE !!! 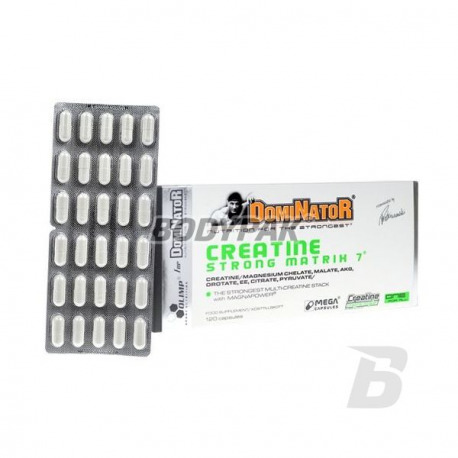 - creatine forms - its amides, esters and chelates - and does not contain the less active creatine monohydrate. 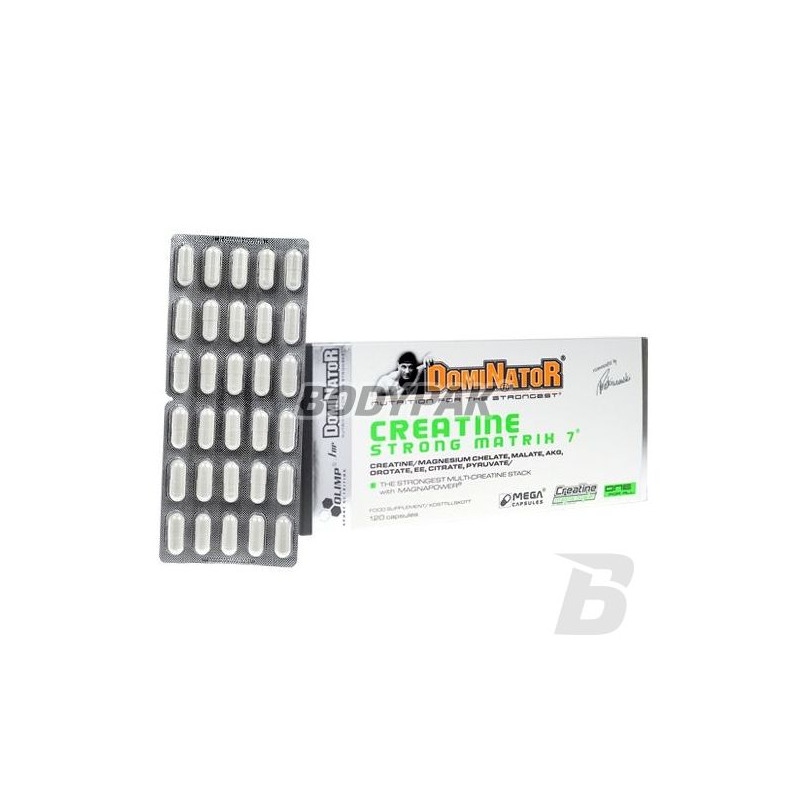 CREATINE STRONG MATRIX 7 ™ - provides extremely fast access to the super active creatine for the production of ATP and long-term maintenance of its increased level in the muscle cells, which guarantees super increases of weight and strength. Malate, alpha-ketoglutarate, pyruvate and citrate used for the production of creatine amides contained in CREATINE STRONG MATRIX ™ 7 inhibit creatine transformation to inactive creatinine and is also closely cooperate with creatine in the ATP production at the stage of generation of this compound in mitochondria of muscle cells. Malate can also - in addition - replace creatine in its function as an alternative precursor of active ATP. Orotate - is a precursor of RNA - a compound which mediates anabolism of muscle proteins at the stage of the process called translation. Magnesium with creatine chelate CREATINE MAGNA POWER inhibits creatine transformation to inactive creatinine and is also used by the body together with creatine for the production of ATP. Magnesium ions remain extremely important ingredients of molecules of ATP and other nucleotides, responsible for their activity and potency. They shape the structure and activity of muscle proteins and inhibit the activity of catabolic enzymes, destroying muscle proteins. CREATINE STRONG MATRIX 7 ™ - is an extremely potent creatine stack, where the word "STRONG" is not only an ornament but reflects the true nature of this product and shows the dynamics of its action. FEEL THE POWER Pudzian !!! Masa mięśniowa do przodu, siła mięśniowa zdecydowanie na plus - polecam!! Sam na pewno kupię kolejne opakowanie!